Martin Dunn, Traditional painter and Decorator in Staffordshire is well versed in the art of oil-based surfacer fillers. 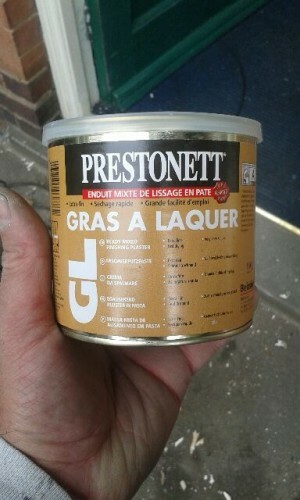 He was recently sent a tub of Prestonnet Gras a Lacquer to try by Aaron at Beissier.Beissier are Trade Corner members. Seeing as they trust me to give it a go, I decided to put my copy of Peoples Friend down to write a few words. 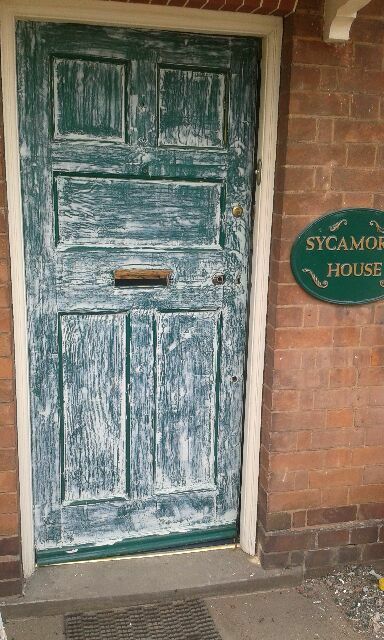 As part of our on-going work at Sycamore House in Tamworth we have made a start on the exterior. The door was given an all over thorough prep. The Gras a laquer was applied using French knifes or filling blades, if you like. Impressions? Takes a while to dry and as it’s oil based, it’s a bit sticky. Rubs down OK on flat surfaces, but a bit hard going in mouldings. At the moment we have only undercoated the door and applied a first coat of Sikkens XD. Unfortunately, we can’t go any further due to the scaffold still being up and a lot of coming and going, so the door is not finished yet. As an oil fine surface filler it works as well as any other I have tried. Would Gras a Lacquer be my choice for a showpiece door or similar? No. If I was trying to achieve the No. 10 look I would still go to my local car paint dealer (Breakwells) and buy TEKALOID. Wet flatting and a coat of Tekaloid brush filler would, in my opinion, give you a better finish. This would then be followed by Tekaloid enamel, or I have no reason to believe that Sikkens oil based glosses wouldn’t take to it. For a super read, budding coach painters, here is a link to Series 2 Club forum where a member has listed relevant Tekaloid products, including the brushing putty, and they talk about the wonder of slow drying enamels. Before I forget, Willenhall is probably the finest town in the world. Sycamore House is coming along nicely and sometime soon, I would like to get photos of completed rooms, but as per usual we are waiting on other trades to finish off before we can see it finished. This is a taster, where we sprayed some of the cornice work. My daughter paid us a visit the other week, she probably wanted some money, but she had to earn it. 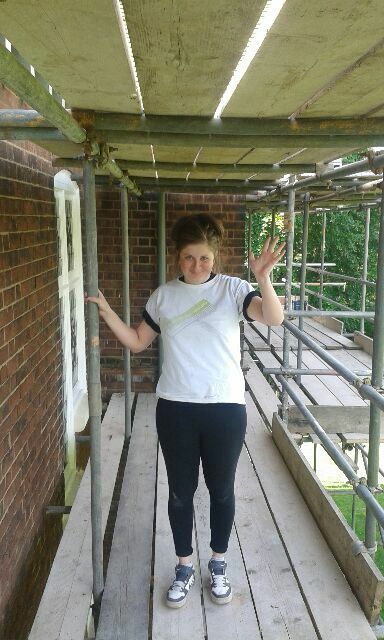 So on with the company t-shirt and up the scaffold to start cleaning the windows. I think she is holding on for dear life in the photo. And she is only on the first level! So, back to gras a lacquer. If you want to take your front doors to a new level, in line with the standard fare of Amsterdam doors, it looks like Gras a Lacquer from Prestonnet is one of 3 reliable oil-based surfacer-fillers now to ask for (Toupret, and Kodrin Spachtel amongst others). This is thePrestonett Gras a lacquer technical sheet for Bon chance! You can also try Martin’s Tekaloid suggestion, which is the car body approach and sure to shine. Brushing Putty especially for mouldings is well known in Holland. If you can’t buy it, you can make it yourself very simple. Mix oil based putty with oil based paint and you have the best Brushing Putty there is! It’s an old Dutch craftmanship trick. I will ask Kristian at VerfBlogger if he can get a shot of the end result in action. Gras a Lacquer is one of the most talked about little used fillers! 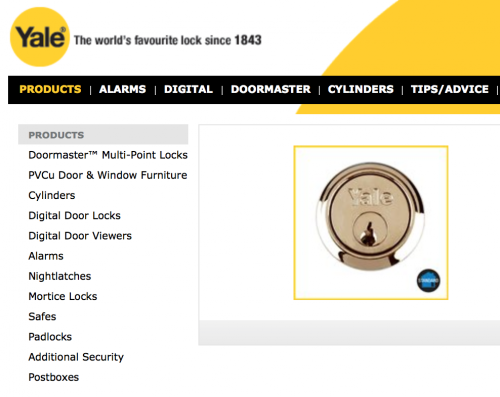 It is used where you are looking for a number 10 front door paint job. Used judiciously, it adds a really good touch to an exterior and everything and everyone shines around it. Or on cills. It will raise the sheen level a notch, so bear that in mind, if your aim is not to have the shiniest finish in the king of shine stakes. Which brands of Swedish Putty type products like the have you used? Had a go with Tekaloid car body products? tekaloid ,brushing filler what’s the drying time, between coats and how long before you can paint.